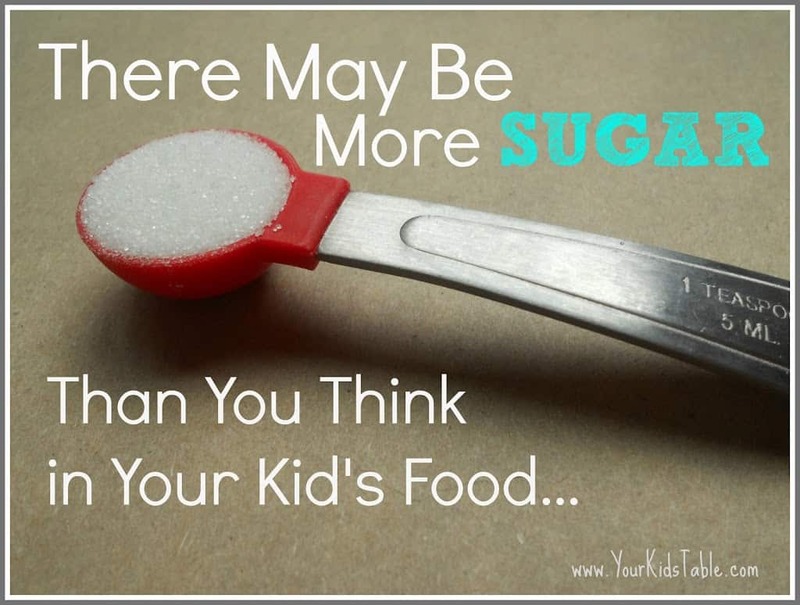 How Much Sugar is in Your Kid’s Food? How Much Sugar is Hiding in Our Food? 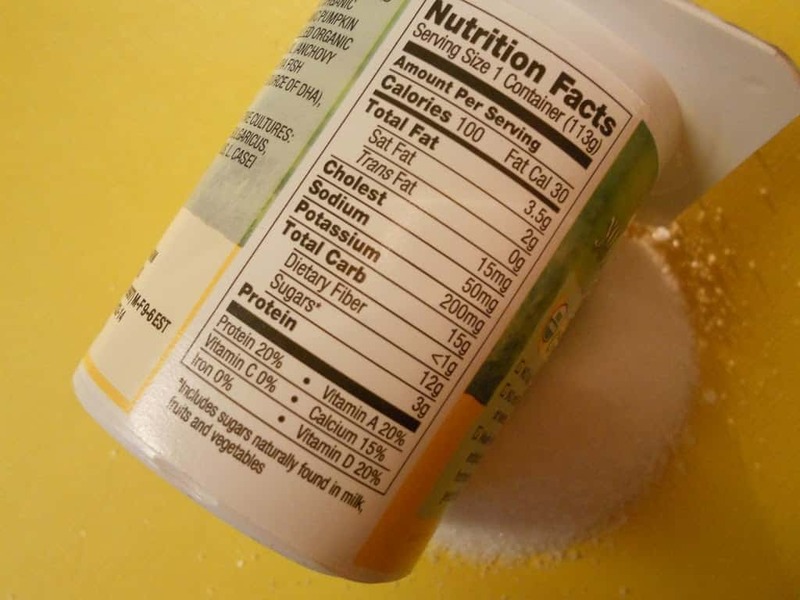 That nutrition label on the back of food containers gives you the amount of sugar in grams. Great, what does that mean? Exactly how much is 11 grams, that doesn’t sound too bad? Well, every 4 grams of sugar is equal to 1 teaspoon of sugar. Generally speaking less than 5 grams is good. However, it is important to keep in mind that fruits and some vegetables have sugar that are occurring in them naturally. Homemade, unsweetened applesauce has 11 grams of sugar. The foods that really raise the red flag are the ones that add sugar into their products and it seems like just about every product on our grocery shelves does. One other thing to keep in mind when you are looking at the label is serving size. Sometimes these are really small and your kid may be eating two servings at one sitting, then doubling the sugar on the label. 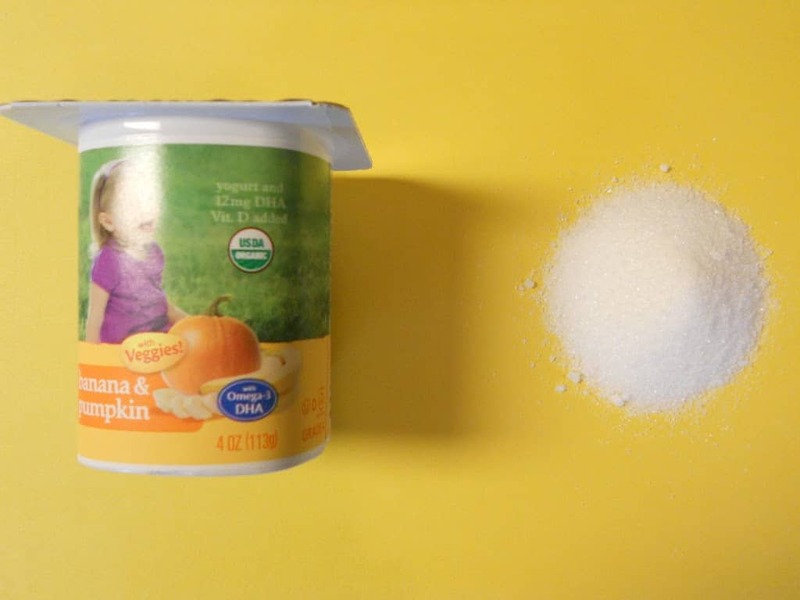 Three teaspoons of sugar (or more) in kid’s yogurt. I remember when my older son was transitioning to table foods and I wanted to start him on yogurt. I stood in the the store looking for something organic, staying far from the popular brands with brightly colored yogurt. I brought home a yogurt with all natural ingredients and my baby gladly gobbled it up, it was very tasty. At the same time I was reading My Two-Year-Old Eats Octopus: Raising Children Who Love to Eat Everything. In that book I learned the 4 gram rule and immediately began checking the little bits of food I was giving my pure little 9 month old. I was SHOCKED that his healthy, expensive, organic, natural yogurt had 16 grams, or should I say, 4 whole teaspoons of sugar in it! What else had tons of sugar in it? Here are some foods I have surprisingly found to have a lot of sugar in them. These numbers may vary by brand. This is by no means a complete list, I find surprising high sugar foods all the time! Read the label! I can’t stress this enough. Now you know what to look for, and although it is a teeny bit of a pain to read labels when you are trying new products, it is the best way to ensure you know what is going into your kids mouth. Remember, look at the amount of grams and the list of ingredients for added sugars. You can also try making some of the foods you buy. For instance, I started buying plain yogurt and putting fresh fruit with a little bit of honey on top. I will admit that my son doesn’t eat quite as much and it was a little of a transition. Another tip is to look for foods that are unsweetened, just be careful they haven’t added in a diet sugar substitute like saccharin or sucralose (splenda). It is pretty easy to find applesauce that is unsweetened. The ingredient list reads: pureed apples. Lastly, remember all things in moderation. If you know you are going to give a favorite cereal bar that is high in sugar, try to keep the sugar intake low with other foods that day. Keep those high sugar favorites for once-in-a-while treats. The American Heart Association recommended that preschoolers not have more than 3 teaspoons of sugar a day and kids 5-7 should not have more than 4 teaspoons. Most kids are doubling or tripling these numbers in a day. Although, there is a lot of research showing that sugar doesn’t effect behavior, hyperactivity, or attention, it does have strong links to heart disease, diabetes, and tooth decay! Do you read labels when you shop? Have you found any surprising high sugar foods? Please share or let me know what you think! I would love to hear from you!!! Thank you! I’m so glad you found your way here! Ha ha, Heather, I understand! To answer your question, yes you are right. If you don’t see any of the sugar or code sugar words like I listed above in the ingredients than it is naturally occurring. You will find this in milk and milk products, too. But, as I mentioned in the post sugar is often added in addition to things like yogurt. Right now manufacturers aren’t required to delineate how much they added and how much was naturally occurring. Hope that helps! That’s why we need to be careful in what we buy. Always read the labels for us to know the fructose intake we had per day. Ha! I love it! We have been debating going gluten free here ourselves! Yogurt is one that really frustrates me! I know it’s possible to make your own, but that is just not practical at the stage of life I am in. We have scoured the yogurt section of the grocery store, and haven’t found a good option that is not loaded with sugar. Catherine- in response to your wonderful comment, yes we look for dyes too. I try to keep it simple and make as much as we can, convenience does win out at times though.